This Amplifier is brand new never used full tested from my Lab. Class AB to C with variable drain voltage. ALUMINIUM HEATSINK, FAN AND 50V/10A POWER SUPPLY REQUIRED FOR MODULE WORKING. The heatsink is only for show and test this amplifier. I sell this item without aluminium heatsing. This is brand new model with lower consumption in 50 volts. This amplifier Designed by Hellenic RF Lab. For VHF broadcasting FM radio. Band transmitters this Linear Amplifier incorporates microstrip technology and MOS-FET device to enhance. This amplifier is build with high quality components ATC capacitors. To operate with this amplifier you will need a heathsink and cooling fan. All amplifiers are tested and warrandy working from my Lab signature. 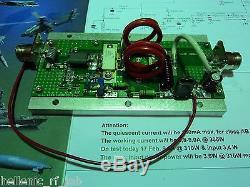 PRICE FOR ASSEMBLED BOARD WITH POWER FET BLF278 or MRF151G INCLUDED. 86 - 110 MHz VHF Band. Input / Output: 50 Ohm. The dimesions of PCB are 58 X 150 mm. The board of the amplifier mounting on 10mm thick aluminum pallets for heat spreader. This is my last professional model with input and output N-Type connectors. This is my last model with aluminum palette and connections offer only 249.99. My offer is only for the first ten pieces and the price is low for promotional purposes. This module is ready to go. The dimesoins from aloumin pallet are 80 X 150mm. I have in stock all models from my amplifiers. All physical and technical conditions are new. Please feel free to ask any questions. I'll quickly answer as possible. If you have any problems, we are very glad to help you. The item "88-108MHZ RADIO BROADCAST AMPLIFIER PALLET VHF 300WATTS with BLF278 or MRF151G" is in sale since Wednesday, March 01, 2017. 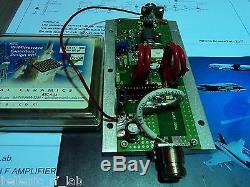 This item is in the category "Consumer Electronics\Radio Communication\Ham, Amateur Radio\Ham Radio Transmitters". The seller is "hellenic_rf_lab" and is located in Athens, ATTIKI / GALATSI. This item can be shipped worldwide.